The signs and logos used in the Academic Week and students course parties, usually designed and built by finalist students, have been more and more present over the last few years. This time, it was us, first year students that came out with the initiative of building our own LED sign with the purpose of better representing our course, attracting more consumers and at the same time, adventuring themselves into the world of inventions. 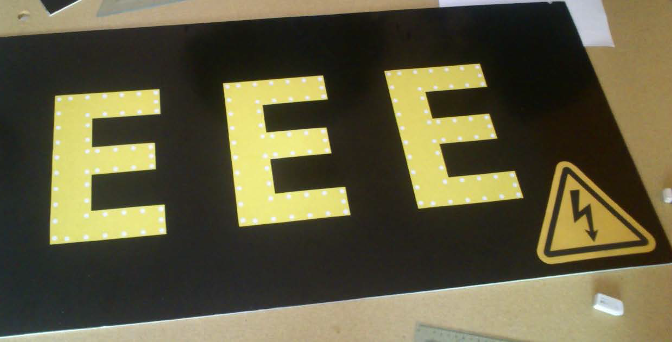 The first year EEE parties commission wanted to build a flashing LED sign which would use a NE555 integrated circuit. Although the visuals of the logo would be important, the sign would also need to have a light structure in order to allow its placement in not so accessible areas. The sign was developed under a board of k-line, a material made of expanded polyurethane. This material was chosen because it’s light and yet steady enough to support the LEDs and the circuitry. The letters were printed onto sticker paper for an easy appliance on the board. 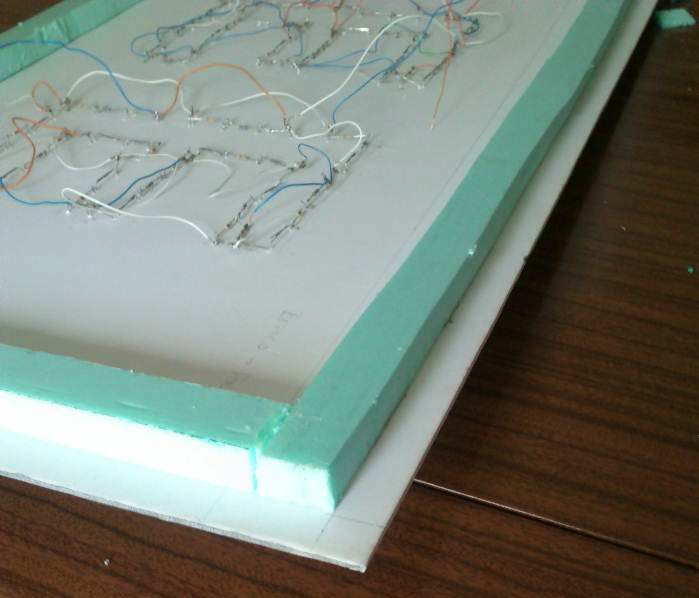 In order to protect the circuit, a Styrofoam frame was mounted on the back of the board, creating a support to isolate the circuit from the wall. The structure was finished with another k-line board, covering the back side of the sign. 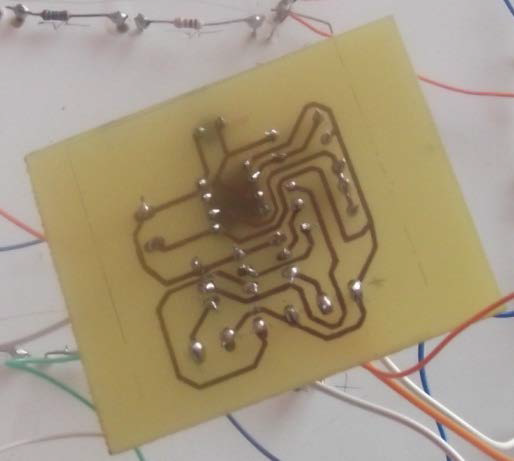 The prototype was developed in a breadboard using a simple circuit from the initial research, however three transistors were added to work as switches, so that the NE555 could control all the LEDs from all the letters in the sign. The IC is working in an astable operation and is also possible to change the LED flashing frequency by changing the values of the resistors (R1 and R2) and the capacitor (C1). Each letter is composed by 52 LEDs (in a total of 156). 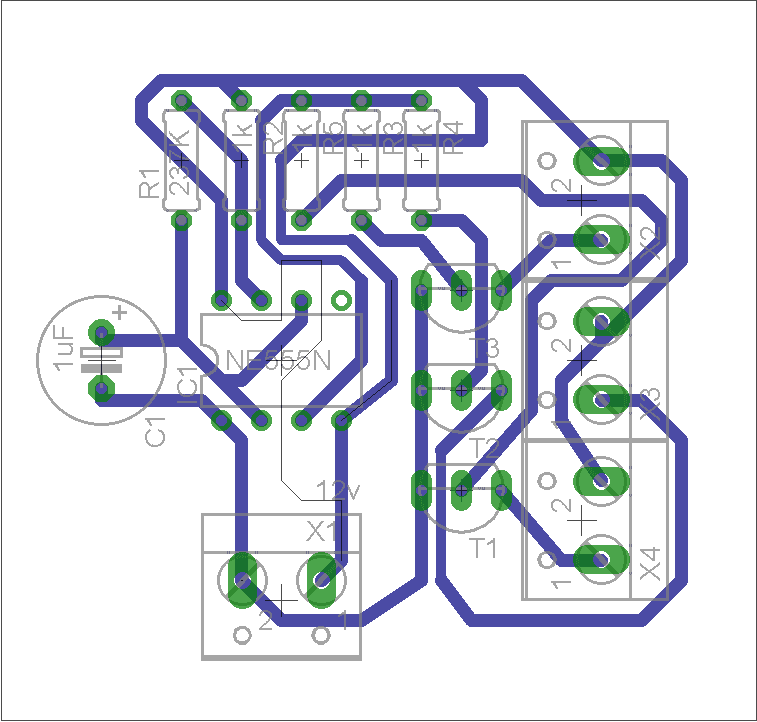 All LEDs are associated in groups of 4 in series with 2 resistors (1KΩ e 2KΩ), all the anodes and cathodes are connected among each other and then connected to the PCB. The circuit is powered by a small 12VDC transformer. Besides that, a “battery” was also created using 8 AA batteries (1,5Vx8 = 12V), in order to allow the use of this LED sign even in places where there isn’t a power socket available.